Truck – Industrial Chassis Inc. This old truck came to us as a “street rodded” finished truck. Decent maroon metallic paint and gray vinyl interior. Didn’t drive worth keeping. Braking was wishful and the steering was about as good as guiding the truck down the road with the same rope steering you used on your first go-kart. The new owner really liked the truck but wanted to actually drive it, he also wanted to make a few changes like a Tremec TKO five speed and a correct dash instead of the street rod billet affair the truck had. It had to come apart after our initial inspection. It had a very poorly installed Mustang II kit from Speedway. The best we could determine was the kit was actually for a 1935-1940 Ford. Not even close enough to work with the Studebaker. The wheels were inset too far and just looked goofy, the anti-dive was backward, the caster and camber settings were not good and the frame wasn’t even boxed, everything flexed and popped. So “off with it’s head” we chopped out everything and cleaned it back to the bare frame rails. There was a bit of minor repair work to be done but fortunately the stock frame was salvageable. 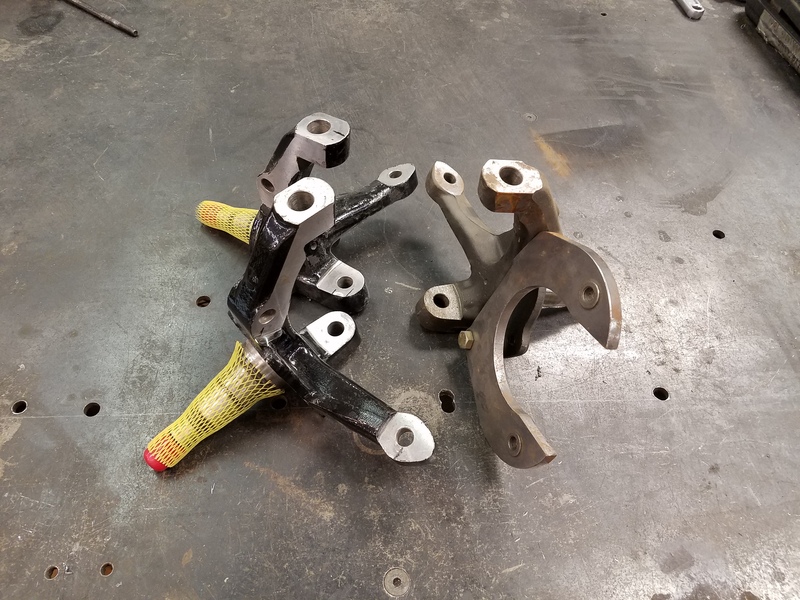 I drew up some boxing plates and a new crossmember system that was two inches wider than a stock Mustang II and adjusted the upper and lower control arm connection points to put the instant center where we needed it and to correct the camber curve for the 1″ longer control arms we were going to build and use. You can also see the tubular frame support and adjustable transmission mount Court bent up and the new Flaming River steering column Kelly installed. Newly fabricated crossmember and boxing plates installed. David (the customer) wanted a manual trans, a Tremec TKO ! The stock below floor brake assembly was butchered beyond use and David likes swing pedals better anyway. Kelly fabricated a new sheet metal box to accommodate the odd Studebaker firewall/dash board arrangement. Then he modified an aftermarket brake and clutch assembly provided by the customer to fit. The rear got some attention too. The truck came to us with a GM Corporate 10 bolt that was a touch too wide, 5 on 5″ bolt pattern and 2.56:1 gears that just wouldn’t work with the overdrive five speed. The springs themselves were shot, so they came out and got rebuilt over at Valley Spring service. New spring mounts were also in order to eliminate the lowering blocks. We also boxed the frame and installed a 2″ deep C-notch. Rear frame boxed, rebuilt springs and new shackles and hardware. In the meantime we got the new control arms fabricated and installed. We used a Dodge Dakota front anti-roll bar also. Bilstein shocks and stainless steel brake lines and a bit of clean up on the frame. We shot it with catalyzed enamel paint. The new Currie rear axle got stuffed in as well as a set of fresh Bilstein shocks. New stainless steel brake lines and the fuel system got treated and reinstalled. Interior wise the street rod dash had to go. Horrid rust sandwich with a gallon of bondo frosting. These are integrated pretty well into the cab. We acquired a donor cab and Kelly cut it out, then carefully trimmed out the offending piece to install the donor dash. While he was busy doing that I designed and built a plenum box to mount under the dash and distribute the cool air from the air conditioning. We also made provisions for the AC unit to draw air in from the cabin instead of hot underhood air. All this got covered up by a nicely fabricated aluminum panel on the engine side.The engine and new transmission got stuffed back in, new through the floor gas pedal from Lokar, the battery box got fabbed, wiring panels got mounted. The cab got undercoated with multiple layers of Second Skin spray on Damplifier. In fact so did the bed and all four fenders. All,Below you will find photos of our 1952 Studebaker PU aka “The Cow Island Express” nearly finished (but shown anyway) in time for the Studebaker International Meet held last week in Glendale, Arizona. The PU was built with loving care by Scott Cawley of Chandler Arizona for Lori and me. The pickup is entirely modified beginning with a Mustang II/Dodge Dakota style custom front end and suspension (built by Steve Szymanski at Industrial Chassis), GM 383 stroker motor (Tony Sanchez), Tremek TKO 5-speed, 4-wheel discs, Currie 9″ rear end and a custom interior by Doug Stinson at All American Upholstery that includes massive amounts of dynamatt insulation. Scott did the flawless body work and the stunning 2-tone paint which is tweeked current Cadillac CTS-V red metalic and champagne. The gold leaf pin stripes and lettering was applied by Tony Perez as was the freehand lettering. Chuck at Metro Plating did the chrome. Particular note should be made of what I consider the signature piece on the truck; the gold and chrome Studebaker hood piece that Chuck spent rediculous time on. Blow it up and take a good look at it. Did I mention it also sound terrific. It had Flowmaster 50s on it that sounded too motorboatish. We went to Scottsdale Muffler and had them put on some Flowmaster Hushpower mufflers that are small and look kind of like glasspacks. With the new tips, the sound is deep and throaty. It drives at least as good as it looks. Nuff said. Besides Scott and the others above, Eric, Big John, Johnny, John the audio guy, Ty and many others worked on the “Cow Island Express”. If you don’t get the significance of the name, ask Scott or Pam Contes and they’ll tell you. I mentioned that it’s almost done; it still has a few minor issues and needs like a dead speedometer, door handle, cruise control and the console with stereo and the critical two cupholders. This unit has a date with Lori and me for Biloxi and “Cruising the Coast” in October. Oh, yeah, it won First Place in the Modified Trucks category at Glendale. Here are the pictures he sent of the finished product.